The previous two volumes of this acclaimed anthology set forth a globally decentered revision of twentieth-century poetry from the perspective of its many avant-gardes. 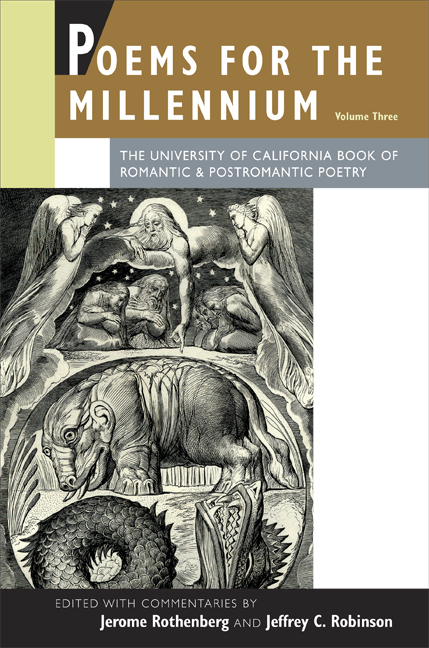 Now editors Jerome Rothenberg and Jeffrey C. Robinson bring a radically new interpretation to the poetry of the preceding century, viewing the work of the romantic and post-romantic poets as an international, collective, often utopian enterprise that became the foundation of experimental modernism. Global in its range, volume three gathers selections from the poetry and manifestos of canonical poets, as well as the work of lesser-known but equally radical poets. Defining romanticism as experimental and visionary, Rothenberg and Robinson feature prose poetry, verbal-visual experiments, and sound poetry, along with more familiar forms seen here as if for the first time. The anthology also explores romanticism outside the European orbit and includes ethnopoetic and archaeological works outside the literary mainstream. The range of volume three and its skewing of the traditional canon illuminate the process by which romantics and post- romantics challenged nineteenth-century orthodoxies and propelled poetry to the experiments of a later modernism and avant-gardism. Jerome Rothenberg is an internationally known poet and Professor Emeritus of Visual Arts and Literature at the University of California, San Diego. Jeffrey C. Robinson is Professor of English at the University of Colorado Boulder.